In the Motherless Daughters Journey class, we facilitate an exercise called “What was it like?” The goal of the exercise is to gain insight into how the age of our mother loss affects us today as adults. There is a basic formula that lends insight into how we function as adults and how our mother loss influences who we are today. So let’s get at it. This will be an introduction to get us started thinking about our own experience and how our mother loss affects us today. In the future we will talk about specific ages and their challenges related to mother loss. First identify your age of loss. Notice I did not say the age of death. This is not difficult for some, but for others it is a different story. How old were you when you first experienced mother loss? The actual loss could have happened long before a mother’s death or the mother may still be alive. When did she stop nurturing you? I recently had a conversation with a 55 yr. old woman who was experiencing lots of emotion over the recent death of her mother. When asked the question about age of loss, she realized it was about 10. Think about this. When did you first experience mother loss? 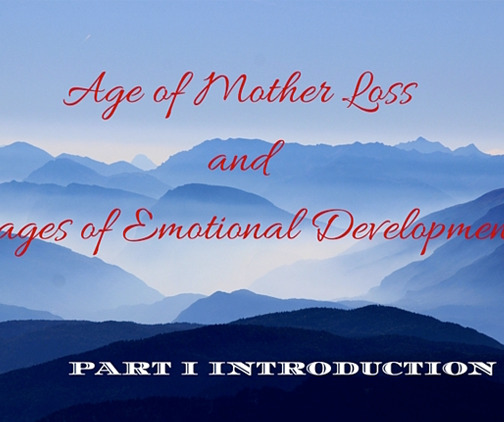 Next is a mini-introduction to Erickson (http://binged.it/1JMYhGb) and the stages of emotional development through our life span. Erickson basically tells us that each age has several emotional development tasks that we need to master. When we accomplish these tasks, we move on to the next stage. Now let’s put your age of loss together with the stages of emotional development. Select the age and stage that best defines when you first experienced mother loss. We stop at the 60s only because most women lose their mother in the age groups that are listed. Occasionally there are women who experience mother loss beyond 70. The last part of the formula has to do with those around you and how they supported you in your grief process. Did they allow you to talk about your mother loss? Did they pretend that she just wasn’t there? Did they encourage you to share your emotions and feelings? Did they depend on you to help them instead of helping you? Was there a safe place for you to grieve your loss? Next month we will focus on the effects of mother loss in the 0-6 year old group. What age and stage best represents you? Looking forward to hearing more about motherloss 0-6. It’s posted. Love to hear your thoughts. Thanks for your comment. Wanted to let you know that the information in this blog correlates Ereckson’s stages of emotional development with anecdotal information from our work with women. We have been working with women for 15 years and certainly understand how mother loss and age of loss are connected. Blog on 0-6 is posted. Take a look. At 46 years old there are many times in my life I feel like a scared 6 year old little girl. I can’t wait to read next month’s blog. Thanks for sharing your comments. The 0-6 age blog is posted. Would love to hear your comments. Age 11. Developmental 6-12. Was sent to counseling but also blamed at home. Thanks for your response. The next blog will be the 6-12 age group. Just so you know, experts say that this is the most difficult age to experience mother loss related to long term adult development issues. Check this out next month. I lost my Precious Mama at 65. We had been together my whole life. I miss her so very bad. She was my world!! I am sorry for your loss. It sounds like you had a very good relationship with her. The hole left from her loss must be huge. I’m very interested and looking forward to the 0-6 stage results. My mother passed when I was 2yrs old! I’m now 27yrs old. My “heartache” is different in a way since i was only a baby i noticed & grieving’s been tough with or without counseling. Thanks for sharing. It is never easy no matter how old you were. The 0-6 Blog is posted. Take a look and see how you may relate to what is written. Waiting for the age of loss in the 20s. I had just turned 20 the month before the loss of my mother to a automobile v pedestrian accident. I never have really dealt with my loss and I think it’s hindered every relationship since then. You were just starting out into your adult life. I will write about this but I want to say it to you now. A woman who experiences mother loss in her 20s is often misunderstood. While you are considered as “adult” as you venture out on your own, you still need a place that is a safe harbor you can go to at any time. Layer on top of your age, you also experienced sudden traumatic loss. With sudden loss, we have to muster up our defenses to manage all of the things related to the loss now. Our grieving does not take place at the time of loss but later. And it comes in bits and spurts. You did not say how old you are now. How long ago did this happen? You are correct that not dealing with the loss will hinder every aspect part of your life. You cannot change the past, but you can change the way you look at the past. Please think about beginning your journey.